05.50 – Tim Carney provides some examples where regulation seems to have an alternate outcome to what was hoped. 10.40 – A look at the options of how we can possibly dislodge the power of big business and government. 11.52 – Politics and the economy are starting to work together because fewer people are now gaining from a specific policy. 14.23 – Government agencies don’t even have to worry about subtlety; if they want you they’ll do what they can to get you. 16.11 – Why is it that they can spy on us and we get no information about Government actions, even when they affect us? 17.48 – Big business benefits from and lobbies for big Government to the detriment of the consumer, the competitor and the tax payer. 20.28 – Technology could be our undoing or it could be our liberation. We’ll have to wait and see. You never hear the dogs that don’t bark; you never know which businesses are just out of the range of existing. Whenever something is put in the arena of ‘Government’, it becomes a home game for big business. The Government should rethink what they think is the public’s business. 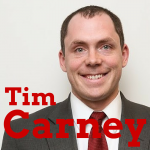 It’s my pleasure to welcome Tim Carney to the show, he is a Senior Political Columnist for the Washington Examiner, and a visiting Fellow at the American Enterprise Institute, and author of The Big Rip-Off: How Big Businesses and Big Government Steal Your Money. Tim, welcome, how are you? Good, thanks for having me. Good, it’s good to have you on. This is a hot topic, unfortunately, but it’s very true. Tim, it’s interesting because when you look at the political divide with the Left and the Right, it seems like one side is for big business and against big Government, but I kind of think it’s just a big wrestling match. It’s fake. This is like a fake dichotomy; it’s sort of the same thing, nowadays at least. Your thoughts? Absolutely. I think the professional wrestling analogy there is apt. Very often, big business and big Government are not in fact the opponents, although they fool Democrats and Republicans into thinking they are, but often they’re the allies. What they want are regulations that keep out competitors, they want hand-outs, corporate welfare, bail-outs, eminent domain-taking mandates and the losers end up being consumers, small businessmen, people who want to be small businessmen and tax-payers. Yeah, or the small businesspeople that want to be medium sized businesspeople but who can’t grow because of the onerous regulations. It’s just interesting to me that you’ll see the people who run the corporatocracy – they’ll be on TV or in media, complaining and grousing about Government regulation, but what they’re secretly thinking (I think!) is ‘Gosh, this regulation is great because it’s just impossible for new companies to enter the market and compete with us.’ This is certainly true on Wall Street with the security laws and with the Jobs Act, maybe there’ll be a bit of a shift there and with crowd-funding and so forth. Talk about that a little bit. It sounds like we agree. This happens in all sorts of industries and you saw James Dimon, the CEO of JP Morgan saying ‘There’s a lot of things about this Dodd-Frank financial regulation that I don’t like, and there are ways in which it will definitely hurt our bank, but on another level, it protects us.’ He used the term ’emote’ and said that these regulations created emote, and it’s a beautiful image. It digs this trench so the guys who are already in the middle, on the island, in the castle get to stay there, and they have protection from competition. If that’s one of the major effects of regulation then you can see that it actually hurts consumers rather than protecting them. Yeah, all the entrenched interest, they can deal with it. If you want to take your company public, or you want to maintain your company as a public company, if you’re big, you can spend $1 million on compliance. If you’re little, you can’t even play the game. Who’s representing the small business out there, Tim? No-one. Where is their lobbying group? What the Chamber of Commerce? I don’t know. There’s a couple of groups but..
Yeah. The Chamber of Commerce is good when it comes to opposing regulations, but they end up supporting big spending, bail-outs and again, even those primarily go to the big guys – the guys who can afford to hire the lobbyists, the consultants, the former congressional aider, the former Congressman. The guys who can afford to hire them are the people who are going to get their hands on most of the Government money when that’s being handed out. One of the problems is what economists describe as ‘concentrated benefits with a diffuse cost’ – the benefits of a Government program, a regulation, a subsidy go to a small group, and they get it a lot. There’s a billion dollar subsidy, and it goes to one company. It costs every tax-payer about $3, so who’s going to lobby harder? The big guys who get the hand-out or the little guys who are paying it? It’s the same with these protective regulations where the businesses that are hurt are often businesses that haven’t even come into being. It’s the guise of ‘You know what, I’d like to start up a food truck and compete with these restaurants, and then he starts dealing with the rules and the regulations and says, ‘OKay, never mind”. So there isn’t really a lobby for the businesses that want to exist but yet exist. Tim, that’s a great point. It’s the ones that don’t yet exist. There’s that principle in economics; you never hear the dogs that don’t bark. They don’t bark because they don’t exist yet. They might exist, but we’ll never know if they could enter and if they could play the game. Then the other one had to do with Uber, where the Unions and the companies that run the taxi cabs around here didn’t want this smartphone-powered, basically a limo service being allowed. It’s a much better system. And so they proposed all sorts of rules that would either bar Uber or at least really limit their activity, or at least make sure that another competitor doesn’t come in. In both of those cases, there was a strong public push-back. Because the consumers of these were rich and upper-middle class, young, politically active, urban progressives, all of a sudden they said ‘Hm, maybe these regulations aren’t helping us, they’re helping the incumbent businesses, hurting consumers, hurting would-be competitors’, and there the big guys have actually lost because the consumer base is active enough to apply pressure to the politicians. Yeah. It just kind of begs the question, and I’m probably going to offend someone here, I’m sure, but I debate these things with people on the Left, with Democrats, and I just can’t help but think how can Democrats be so dumb? How can they not see this? They’re always pleading for more regulation. When the financial crisis happened, they were saying ‘Oh, well these big companies weren’t regulated enough, and that’s why it all happened’. That’s the surface argument, and I can see how one would think that, but what we never hear about is the fact that they became too big to fail because of the regulations. You can’t compete with Lehmann Brothers, you can’t compete with JP Morgan. Well, Lehmann Brothers is obviously an old example, but you get the idea. Guess what? 80% of export/import bank subsidies go to big business, and the small businesses who get the other 20%, in some cases, can be up to 1500 employees. Not only that, but a third of export/import bank subsidies go to one business – Boeing, which is the largest exporter in America. When the Government sets up these programs, it helps the big guys. One thing I always say is that whenever something is put in the arena of Government, it becomes a home game for big business. Yeah, it does. OKay, so what are some action steps that people can take? What can we do about this? It just seems like you get these entrenched interests and they can just never be dislodged. They’re so powerful and they have such scale. Is there anything that can be done? First I’ll say the reasons to be depressed. It is a self-reinforcing thing. The politicians and the lobbyists and the big businesses that can hire them become an inside circle and they can all benefit each other. How can everybody be benefiting in this sort of situation? There’s two ways in any kind of economy that everybody benefits. 1: If there’s actual creativity and growth and creation, but that’s not happening here. The other is if they can extract wealth from everybody else, and that’s exactly what’s going on here. Everybody in power is benefiting, and everybody out of power is losing. That’s the depressing part of the answer. On the other side, I have seen things like technology creating these decentralizing effects. The way that things like Uber and food trucks have been able to win, and then there was a law called the ‘Stop Online Piracy Act (SOPA)’ a couple of years back. These had all the special interests, all the insiders behind it, and the small guys won because of organizing over the Internet and over social media. That’s one half of it. The other half is just the political pressure. I think the Tea Party has been a very good source within the Republican party because what it is is all of a sudden, then are politicians where if they have a message that really resonates with people around the country, they can suddenly raise money. You need money to win an election! They can raise money from them, instead of doing what the Republicans have always done before, which was always raise money from the business lobbyists. Now it’s easier to get grass roots money and grass roots organizing. That’s the hopeful thing, that there can be a push. There’s money coming in based on what people believe in, and not just on people who stand to prophet from a specific policy. Yeah, that’s nice and hopefully technology will allow us to do that. Do you really think the problem is mostly the business of lobbying and the lobbyists? I mean, lobbying first of all, I should say, is a constitutionally protected right. We would never want a world in which nobody has the right to go and try to tell Congressmen either what they need or how they’re going to mess everything up or anything like that. On the other hand, the problem I see is not the lobbying, but the incentives that the lobbying industry creates for the people who are supposed to be our public servants. We call it the revolving door. The revolving door is where when you leave Congress, if you’ve served a couple of terms, you are guaranteed to be paid a ton of money – often $1 million – to be a lobbyist for special interests, and often for a firm that represents a handful of businesses. If you’re a top-level Congressional staffer, you might be making a decent salary of $140,000, but you’re raising kids, you’re in DC, it’s expensive. Lobbying firms come along and will hire you for half a million, and they go and they do that. Then these lobbying firms have these guys who have direct access to their old bosses, or to their old underlings who are now the Chief of Staff. That gives them undue influence but again, go back to what their incentives were when they were on Capital Hill – it was to play ball with the special interests, it was to make sure not necessarily how they’re going to vote, but to schmooze and to listen to them and to be reasonable by their standards to make sure you’re going to get hired. That is the biggest thing rigging the game against hope for fairer stuff. These guys’ incentives – the staffers and the elected politicians – are to play ball with this revolving door system. And you have that too, going on within the Government agencies, of course. You have the auditor or examiner who works for the SEC, and then they go and they investigate a certain company – say it’s Goldman Sachs, for example – and somehow, a few years later, they seem to end up working for Goldman Sachs. To argue that there wasn’t some sort of subtle bribe there, if not an overt one like ‘Hey, we’ll hire you and quadruple your pay’. Can’t the Goldman Sachs guy sit across from them on the table and say ‘Hey, you’re really good at your job, maybe you should come to work for us some day’. That’s like Jack Abramoff, who went to jail for illegal lobbying practices – he used to tell a story like that. He said how he’d be trying to persuade some Congressman staffer to put in an earmark or something, and then one day they’d be socializing, not talking about work at all, and he said ‘By the way, I know you love working on the hill, your boss is a great guy and I know you’re good at what you do, but if you’re ever looking for a place, you’d fit in really well at our firm.’ Once he said that, he had them in the bag. This is just disgusting. I’m sure this happens at every level of the SEC, the FDA, the FAA, the FCC. This is unbelievable that this stuff is allowed to happen, right? Think about it: why aren’t these meetings public record? When Congress meets, there’s a transcript, there are minutes. Why isn’t it that every communication with the lobbyists is recorded? Why isn’t it available for the public to listen to? And even if they need the privacy – say I’m a company coming in and I say ‘Okay, let me tell you, we have a unique business model so there needs to be some privacy’. The nature of the discussion and the fact that it happened, I think, is certainly the public’s business. Yeah. Of course. Good stuff. Tim, just before you wrap up, do you want to talk about Obamanomics? That’s your other book – do you just have the two books? Yeah. So The Big Rip-Off and Obamanomics are the same thing. They’re the idea that big business and big Government are often allies. Big business benefits from and lobbies for big Government to the detriment of the consumer, the competitor and the tax payer. In Obamanomics what I did was I just took a look at Obama’s policy. In The Big Rip-Off I go back to the Whisky Rebellion and talk about Teddy Roosevelt and that sort of thing, but in Obamanomics I just point out how the drug industry wrote a huge portion of Obamacare and how the stimulus was Christmas for lobbyists here in DC. I wrote about how Obama was the one man who could have stopped the bank bail-out but he didn’t. One of his fundraisers was Warren Buffett, who invested millions in Goldman Sachs because he knew the bail-out was going to happen, and then he made lots off of it, and all these things. Not that Obama is worse than previous Presidents, but that Obama had promised to be different. He’d promised to freeze out the lobbyists and obviously did not. If the special interests had been winning as much under President Obama as they have under every previous President, which was obviously not what hope and change was supposed to be about. Yeah, no question about it. It’s just unbelievable. I just kind of wonder what’s going to become of our country. There are so many really positive things, and I think almost all of them revolve around technology and innovation, which is just awesome. In so many ways, Tim, we’re living in an amazing time. Maybe technology and mostly that related to communication will save us. You mentioned before how people can get together and you talked about SOPA and so forth, and as long as that’s really allowed to be this democratized, free, level playing field, maybe that will save us. When you look at it on the Government side and the big corporate side, I’m like ‘Wow’. The abuses that are happening are insane, and I tell you, I kind of think that during our natural lives we’re going to see a strong and serious succession movement. I have no idea if you have any thoughts about that, but it’s something to think about. I’m somebody who thinks that the United States is a pretty strong country and that things will proceed basically without major changes. I do think often that technological development will result in people being more able to live their lives in a lot of ways. That obviously can be cut the other way. Let’s say the power of technology is used in ways that infringe on our freedom, but a lot of it – even if the politicians and the bureaucrats want to force us into a funnel of uniformity, that will become part of it. When you look at things like Uber, when you look at things like people getting cell phones and not being tied down. All of a sudden, you see ‘Wait a second, we can make a lot of these regulations unneeded’. I think that my version of a succession movement we could get is that it’s not going to be a political one, but people are going to find it easier to live their own lives without dependence on the big businesses. We won’t be as dependent on duopolies or monopolies in a lot of businesses. I have friends – Nick Gillespie and Matt Welsh – who wrote a book about that. Maybe that’ll happen in politics, but often politics just adjusts to what the people are doing. Technology will be, in a lot of cases, a fairly liberating thing. Yeah. Technology does, in many ways, have the result of fragmenting marketplaces. On one hand, it gives big Government and big business a scalability advantage and it allows them to scale really quickly, but it also allows this fragmentation where there’s more consumer choice in many ways, and there’s more of the long-tail concept and more democratization, more start-ups. Let’s just keep a vibrant start-up business environment because that’s where all the innovation comes from. Yeah, and that’s always what matters most to me. If there’s innovation and experimentation allowed, then we’ll do well. If there’s not, then we get what we’ve had in the airline industry for decades, which is stagnation. As long as people are allowed to innovate and experiment, I think we’re going to be doing pretty well. Good stuff. Good thoughts. Tim Carney, thank you so much for joining us today. Give out your website, tell people where they can find out more about you. Yeah, www.WashingtonExaminer.com which is where I write, and my Fellowship is at the American Enterprise Institute, www.AEI.org. And of course, the books are on Amazon and all the usual places, right? Everywhere you can buy books online: The Big Rip-Off and Obamanomics. Alright. Tim Carney, keep up the good work. Thank you for joining us today for the Holistic Survival Show, protecting the people, places and profits you care about in uncertain times. Be sure to listen to our Creating Wealth Show, which focuses on exploiting the financial and wealth creation opportunities in today’s economy. Learn more at www.JasonHartman.com or search ‘Jason Hartman’ on iTunes. This show was produced by the Hartman Media Company, offering very general guidelines and information. Opinions of guests are their own, and none of the content should be considered individual advice. If you require personalised advice, please consult an appropriate professional. Information deemed reliable but not guaranteed.